Starting today, we’re introducing a new, redesigned Dashboard that unifies the old dashboard with the course catalog. We’ve done this for two main reasons: to make it easier to browse the content on Codecademy by putting all the skills you can learn in a single page, and secondly, to make it easier to gauge your overall progress on the site. Now, on the new Dashboard, you’ll be able to see which skills you’ve started learning—as well as your progress in them,—and which ones you’ve completed. You’ll also notice that we’ve opened up some room in the header. Don’t worry, your points are still alive and, as before, you can look at how you’re doing by accessing your Profile. 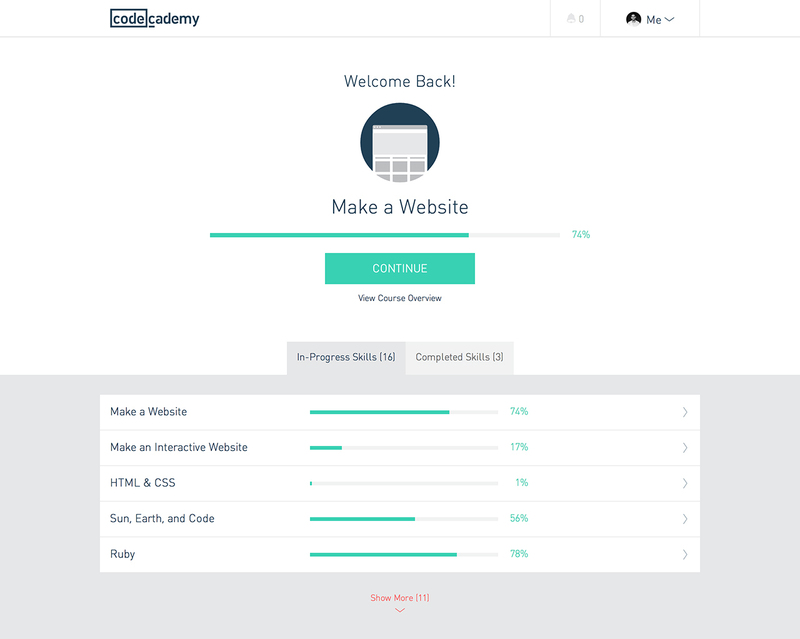 Clicking the Codecademy logo will lead you to the new, unified Dashboard page. As for the Teach page link, you’ll now find it in the footer. The final change you’ll notice is on the Profile. Now, your Profile will show only the skills you’ve completed. This is also where you’ll find Codebits. We’re excited about these changes and we’d love to hear what you think. We’re committed to constantly improving your learning experience, so stay tuned for more updates! In November, we partnered with the leading non-traditional providers of coding education across the country to launch ReskillUSA, a partnership designed to educate Americans on the range of options that exist to teach absolute beginners the skills they need to find meaningful work. We're proud to announce that Codecademy is partnering with DonorsChoose.org and Google in an effort to double the number of high school girls studying Computer Science.